Western Digital has been making some of the world’s best hard drives for decades, and their current My Book line of external USB hard drives are simply outstanding. External hard drives are perfect for backing up large amounts of data, and the WD My Book 6TB USB 3.0 Hard Drive with Backup will store a ton of it. 6TB of storage is more than enough space to hold all of the average user’s data with plenty of room to spare. Photos, music, video…you can keep it all safe and secure with this excellent drive and its included backup software. The WD My Book comes with a fast USB 3.0 interface for speedy file transfers and all stored data can be secured with a password and powerful hardware encryption. As for the dive itself, what can I say? 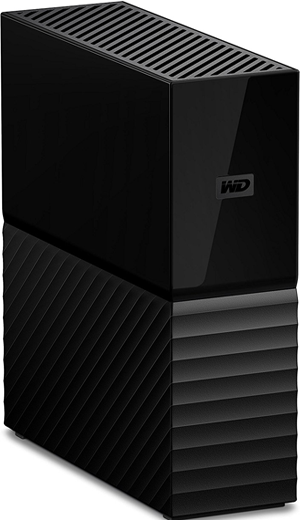 It’s from WD, and they make some of the most reliable hard drives on the market. And the case? Well, I do have to say that it’s a little blah in appearance, but it’s well-constructed from a durable plastic and built to last in my opinion. There is one thing I feel the need to mention here. This drive was designed to stand on its end, not lay down flat. Allowing the drive to stand up helps it better dissipate heat, ensuring that it will run cool instead of over-heating. That being said, I intentionally tested the drive by running it while laying on its side for several hours and although it ran a little warmer than usual it never got hot to the touch. Bottom line: I have used and tested many external USB hard drives, and this is my favorite of the bunch since it combines WD quality with a huge 6TB of storage space. If you’re looking for a speedy, spacious and reliable backup drive, I don’t believe you’ll find a better option than this one. Click here to read more about the WD My Book 6TB USB 3.0 Hard Drive with Backup at Amazon, including approximately 1,600 overwhelmingly positive user reviews.